After defeating an attempt by four men to kill him, a cowboy (Scott Glenn) saves a stranger (Kevin Kline) left to die in the desert. 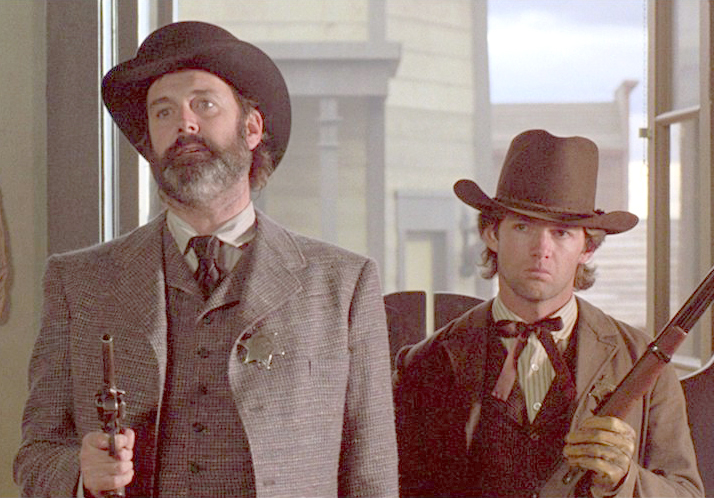 Headed in the same direction, the pair meet up with Glen’s brother (Kevin Costner) and a fourth man (Danny Glover), who was run out of a town. It isn’t long before the quartet find that they each have a quarrel in the making at their destination, and only by working together can they come out alive. 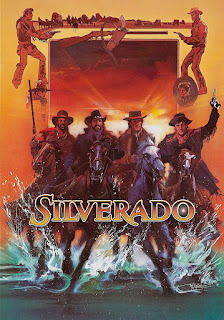 This is the third time I’ve seen Silverado, so I must like it. Indeed, I find it an enjoyable film, and a good one - though not a very good one. Why do I like it and why is it not very good? The story here is decent, though it doesn’t offer anything new. That’s all right; I don’t demand that a movie ‘push the envelope’, as the saying goes. It needn’t even buy postage or be put in a mailbox. A simple movie has its advantages. But Silverado comes close to being simplistic. It is a straightforward good-guys-versus-bad-guys tale. With one exception, every character is exactly what you think he is from almost the moment you meet him. 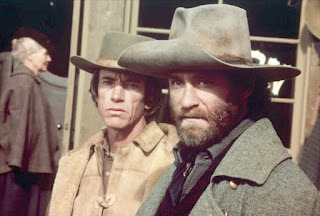 Kline and Glenn are cowboys who have experienced much, both having served sentences for crimes, both still decent at heart, though Kline wants to avoid trouble to the point of seeming apathetic to others’ troubles. Costner is a little boy in a man’s body; Glover has suffered discrimination and hardship. The villains are also plain to see. Dennehy is suitably menacing from the start; Jeff Fahey is borderline-crazy, etc. There is no development of story or character here. I certainly don’t seek an apology for it; many wonderful movies had lacked those characteristics. 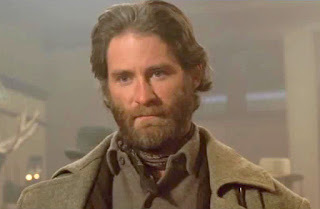 Silverado has more in common with Randolph Scott and Joel McCrea films than later westerns, and, like those, it makes up for any deficiencies with good actors, believable performances and exciting action. The players overcome the limited personalities they are given. Kline, someone I always find entertaining, is immediately likeable, as is Glenn, in a rougher way. They come across credibly as two men who would back each other up, simply based on instinct. Costner I thought annoying, but I usually do. Dennehy, who can switch from sinister to supportive with a director’s snap of the fingers, gives a memorable and skillful performance, as is his wont. John Cleese, far out of his usual milieu, is nonetheless convincing as a decent and tough sheriff. The gun-play is thrilling (though I always marvel at how many men in westerns are killed outright by a single shot), and the scenery is well-used. 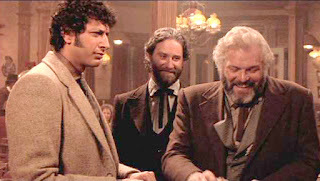 The undefined moment in the Old West during which the movie is set is realistically depicted without going too far, though I thought the script rather anachronistic. Silverado is a good movie for a thoughtless weekend evening; there is no deep philosophy, no interpretation of events or individuals. There are, however, a fine cast, exciting fights and a feeling afterward that the viewer has watched an adventure - however often he may have seen it before. Yes, movies don't have to be in the top ten to be enjoyable. I forget titles sometimes, too. It happens especially with films noir; many are good movies, but they tend to have interchangeable names, such as 'Impact' or 'Danger Zone'. If you recall the title of yours, please let me know.